The End of Money and the Future of Civilization considers the money problem within the broad historical and political context that has made the control of money and banking the primary mechanism for concentrating power and wealth and the nullification of democratic governance. It provides the necessary understanding for entrepreneurs, activists, and civic leaders to implement approaches toward monetary liberation, approaches that empower communities to restore their environments and democratic institutions, and begin to build economies that are sustainable, equitable, and insulated from the financial crises that plague the dominant systems of money, banking and finance. It provides specific design proposals and exchange-system architectures for local, regional, national, and global financial systems, and offers strategies for their implementation prescribing actions that grassroots organizations, businesses, and governments will need to take to achieve success. The book may be ordered direct from the publisher or from Amazon.com, but it would be most helpful if you would order it from your independent local bookstore. For the growing ranks of monetary reformers worldwide, long-time expert Greco’s deeply-researched new book is essential reading. This gripping blend of theory and practicality lays out all the options for creating saner money and credit systems …and the real possibilities in today’s information age, of electronic trading and exchange, at last, without the need to use money at all. — Hazel Henderson, author, Ethical Markets: Growing The Green Economy(2006), President, Ethical Markets Media (USA and Brazil). [The End of Money and the Future of Civilization] is a chilling and gripping narrative that examines the history and current condition of our 300 year old unbalanced and unsustainable monetary system. He goes on to propose specific changes that when adopted will transform our money system into a more user friendly platform of exchange that will benefit all of the worlds people. Simply a must read for everyone. — David Wallach, President of the Board of the International Reciprocal Trade Association. My Personal Journey • Seeds of Disillusionment • Awakening • In the Wake of Inflation • E.C. Riegel • Why Yet Another Book? 2 Mega-Crisis and Metamorphosis-Can Civilization Be Saved? I met you very briefly when you came to Burlington, VT for the Baillie Conference in June of 2006. You even generously signed a copy of “Money” for me. I concur with almost everything you write and say, probably with everything you say. One thing I’ve noticed is that while your vision of a transformed economic/financial landscape is shared by a lot of people, they might not have the means nor the practical knowledge and skills necessary to get to this transformed world. What we need now is a vibrant combination of “how to” and “why-to”. I applaud all you have done to awaken us from our “dogmatic slumbers”. Now, with your help I hope to help carry the transformation forward here in Vermont a bit more. There is no problem with dreaming; but we need to put the “foundations under them”. Thanks, Nick, for your positive comments. Yes, these ideas need to be put into practice, that is why I am offering a weeklong course in Greece this summer. If you really want to carry the transformation forward, you should participate in this course. This collaborative and problem-centered course titled, Exchange and Finance for the New Economy: Principles and Practice, is intended to stimulate the development and deployment of community currencies, moneyless exchange system, and equitable finance, and is designed especially for social entrepreneurs, enthusiastic agents of change, government officials, and serious students who are ready to co-create a new sustainable and convivial economy from the bottom up. It will be held from 24 June thru 1 July, 2016 at the Kalikalos holistic summer school on the Pelion peninsula in Greece. Details about the course, fees, and booking are at http://www.kalikalos.org/exchange-finance. One or two bursaries may be available to qualified low income participants. But where change would be necessary to make an end to exploitation and capitalistic illness, there is therapy and doctoring instead, and these are commodities, too, existing also in excess: In 2012 (in Germany) 633 million pharmaceutical packages were prescribed, that are 37.9 billion daily doses. Somewhere else military tanks are mobilized against rebellious people, here the prescription pad is used. Without connecting to illness as a protesting force and without practical possibilities against doctoring and therapy nothing will ever going to change. Not a word about that in this article. At least, other people address this. Well, Ted, I think you may be throwing out the baby with the bath water. It is the scarcity of money that causes us to be dominated by it. But, money does not need to be scarce. Universal abundance is possible. We can all have what we need to live dignified, fulfilling lives. If you want to know what I think, read my books. I think you’ll learn something useful to you. I have seen them go from things the size of a house requiring enough power for a small village, to things a million times more powerful that fit within a matchbox and use a couple of watts or less. I expect to live to see the same processing power in something smaller that a blood cell, requiring a few nanowatts. I don’t know about everything we WANT. Wants are endless and manufactured by Madison avenue. Many wants are based in neuroses. But we already produce MORE THAN WE COLLECTIVELY NEED. Making sure that it gets properly distributed requires a change of mind and transcending the global interest-based debt money system that makes money scarce and distributes it to serve the power and wealth agenda of the global political-financial elite. The question is how to get from here to there? Yes – that is indeed the question. I have read the various comments and I would like to express gratitude that the world has access to authorities like yourself and Mr Ted Howard. I am based in Zimbabwe and despite achieving a level of success I have come to appreciate that the monetary system currently in place is not sustainable. As a student of accounting many years ago I studied what was in the textbooks and at the time I suppose I like many others were under the influence of intentional indoctrination. I guess I am one of the few among my fellow countrymen that have awakened in the past 2 years to the motives and agenda of the banking elite and power mongers. Having an enterprising nature coupled with my humanitarian nature I have been looking at alternative solutions to the current outdated economic models. In a country that does not have its sovereign currency I think the time is ripe for alternative solutions. I resonate with some of the alternative models presented though I have not yet read any books apart from extracts from some websites. I would like to play my role using my talents to empower people, to implement solutions that will enable them to be more self sufficient and despite the country having been subject to ruin due to politics and mismanagement I believe that the human resource and the inherent talents are the greatest resource a country can have. I would like guidance in this quest as I consider yourselves authorities in these alternative solutions and I a recent novice lacking practical implementation of these alternative models. Hello Sanjay, welcome to the movement for systems of exchange and finance that promote the common good. It is people like you who have an “enterprising nature coupled with a humanitarian nature” that will bring the necessary changes to fruition. I have devoted the past 40 years of my life to understanding sound principles of exchange and finance and building up a body of work that I think will guide motivated people such as yourself toward effective solutions. This site is the primary resource. Links to many of my interviews are also listed in the sidebar just below that and under the menu item, My Videos and Sites. My interview with Daniel Pinchbeck. Find it in 4 parts on my YouTube Playlist at https://www.youtube.com/playlist?list=PL70F023FD1CB9A7ED. There are many sources other than my own work at my other website, Reinventingmoney.com, http://reinventingmoney.com/library/. I especially recommend the works of E. C. Riegel. One or two bursaries may be available to qualified low income participants. Our world definitely needs more people like you. The “money” phenomenon has become the most repugnant “phenomenon” of our times as it takes over everything, including the universe itself, and is the cause of our inevitable demise!! Waiting for the big changes to really take shape effectively in the financial regulatory systems as a wake-up call to BIG corporate magnates!! Why isn’t the book free? It costs money to produce. My publisher needs to recover costs. I didn’t find another way to join you. 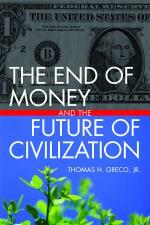 I would like to know if a french version of your book “The end of money and future of civilization” exists. A .pdf version made available via your web site would cost you almost nothing and likely boost sales of the hard copy, if the content is up to scratch of course. That site also provides some excerpts. Just click “Look Inside.” Among other things you will find Appendix A, A model membership Agreement for a Credit Clearing Service. Very Important! Glad to see this idea is getting some attention, have not read the book, but am familiar with most of the concepts and arguments involved. Its certainly not a new idea, but crucial to the future of civilization as we know it. The problem as i see it is how to wake up the sleeping masses. i know this must be addressed in the book and am sure it looks good on paper, but are people ready to take action? We didn’t just fall into this pit, we jumped into it by allowing the central bank to come into existance in the first place. Jefferson said long ago; “I believe that banking institutions are more dangerous to our liberties than standing armies”. Who listened? He also said; “Mankind are more disposed to suffer, while evils are sufferable, than to right themselves by abolishing the forms to which they are accustomed”. Was he not insightful, almost prophetic about what was to come? Can’t wait to get your book from my brother. He’s gone to Indonesia, Vietnam, etc and will be back by 2nd week of Dec. I hope he finds it in Kinokuniya! I don’t know how to order it over Amazon….. If you know of “anyone” 😉 coming to Penang and has a copy of your book to share (it is top 15 most Sharable) please share one with me! I just attempted to grab the RSS Feed to this site and I am not sure why, but it is not showing up in Google Chrome. Any suggestions? I am just wondering if it has crossed your mind to be a candidate for this coming presidential elections I think that even if you don’t win may be you can get people to read your book .